It serves such a huge district, the waiting area being full every day of the week with patients who are severely ill. Unlike our hospitals, patients present in the acute stage of illness, so many try the ‘local traditional methods’ first and as a last resort arrive at the hospital. Lack of education, fear and the cost are the main hurdles to overcome. The problem then is that so many of them are so sick that it’s a battle to save them. The mortality rates are monitored very closely and every effort is made to preserve life. The children’s ward was heaving with 2 or 3 children per bed, those with malaria, dysentery, burns and severe malnutrition. I don’t think we have ever seen so many severely malnourished children with terrible open, weeping sores at the same time. The new police Chief came to visit unexpectedly one day as they were admitting one of these children, he was so shocked to see the condition of the child, it amazes me that the officials have no idea what is happening out in the villages. Sadly a week later the child died, he was just too weak to fight the infection in the open weeping sores all over his body. We were rather baffled to find that the Nutrition Centre was the busiest we had ever seen it with 36 children in varying stages of malnutrition. Some had been in for several weeks and were due to be discharged, while others had only just been admitted. We counted 17 new cases in just a week many of them with oedema and sores all over their bodies and in their mouths. This is the most dangerous form to treat as already their kidneys and livers have been damaged. Feeding too much too soon overloads the organs and they die. In times past they would have been put on a drip but this is the worst thing you can do. Small 2oz feeds every 2 hours have to be given, for the weakest ones by syringe or spoon if they will take it. Many of them hover between life and death for several days. We came across one of these children the first day lying on the ground, not moving, covered in open weeping sores. It was only the intermittent groan from this stationary body that gave any indication the child was still alive. He was transferred immediately to the children’s ward and given intravenous ampicillin. We asked Norma if he would survive – he said ‘it will take a miracle’. Imagine how amazed and delighted we were 36 hours later to find the child sitting up on the bed – still moaning and taking small spoonful’s of rehydrate – quite remarkable. Unfortunately, that’s not always the outcome, but for this child hope had been restored. The second photo is the same child 3 weeks later, he has a way to go yet, but already he is looking much healthier. Talking to Norma and the medical staff about the sudden increase in cases comparative to the past two years, we discovered that the biggest percentage of the worst cases were coming from much further afield. One had travelled 8 hours to get to us. In fact, the child we had first come across had been transferred from a Nutrition Centre over 3 hours’ drive away. They had tried unsuccessfully to treat him, but knowing of the King’s Village had felt that was his only hope. We even have some referred from Tamale as the main general hospital doesn’t have the expertise to treat them! It seems that when the children from the more local villages return home the impact is on two levels. The village sees their amazing recovery and is also impacted by the good nutrition training given to the mothers/carers. These mothers are taught about using what they grow to provide the right level of nutrition and this, together with good hygiene and sanitation has started to make a real impact on their communities. Some of the mums (the more entrepreneurial amongst them) have gone home and created little businesses. They make the porridge and sell it to other mums in the same predicament. Others have just taken their knowledge and shared it with friends and families. It’s so strange last January we were wondering if we’d done such a good job there may not be such need for the Centre in a few years. Only to find that now its influence has spread far and wide! 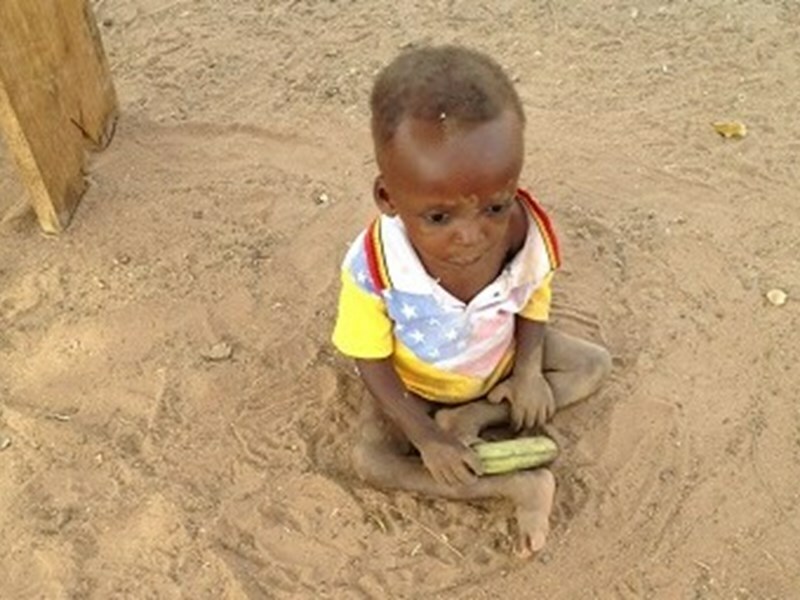 In fact now we have another problem, with so many children regularly there, our costs have gone up – more mouths to feed! For those of you that kindly gave last year for the refurbishment of the doors and windows of the Nutrition Centre I am glad to report all are now replaced, painted and looking sturdier than before. In fact overall the Centre and the huts were in good repair. We are looking at the feasibility of building a small brick unit alongside the Centre to house the children that have been discharged from the hospital across to the Centre but still need close supervision. At present they join the other children in the huts and it’s often then that out of sight they deteriorate and need readmitting to hospital. It would be a simple 4/6 bed unit close to the Centre which would make observation much easier. A nurse would visit several times a day to ensure that all meds were being taken properly. This in turn will go some way to helping relieve some of the pressure on the children’s ward in the hospital by potentially releasing beds sooner. One of the children who graduated The Kings School last year is now in one of the best senior schools in the north, having not only got in due to his academic capabilities but also his football skills. He comes from a farming family and would never have had that opportunity of further education had it not been for the King’s School. There are many stories like that untold. These children are the next generation that are having the chance to change their lives, the lives of their families and in many cases their communities. It is lack of education leading to ignorance, which has kept this region in such a deprived condition. The Water and Sanitation Program has continued in a much scaled down way but during the year visits were made to many of the communities to encourage them to continue with the good hygiene and sanitation practices we had taught them. It’s encouraging to see the significant reduction in the amount of rubbish left around the villages and our hope being that it continues! We took our annual trip; across the Volta by canoe and then through the bush on motorbike to Singa. We were very pleased to see the clinic in good repair and being well used by the 3 male nurses that are employed by the area health authority to run it. As with all the clinics drugs are scarce and only dispatched once a month. It’s incredibly frustrating to have patients that you diagnose but are unable treat with even the most basic drugs. That said the nurses were motivated and hardworking and were doing training programs in all the villages on varying aspects of health and maternal well-being. We left encouraged, even more so when a family agreed to send their malnourished child to the Nutrition Centre. It’s always a battle to get families from across the river to release the children and mothers, they have the impression that to go across the Volta may mean you never come back; superstition has caused the death of so many adults and children. Next June the Nutrition Centre will have been open for 10 years, amazingly with the same Nutrition Officer, Norma, still heading it up. To date over 4000 children’s lives have been saved with the number continuing to rise. Community follow-ups continue but where are some of those from those early years? Many will be 13/14 years old, some will have had the opportunity to attend village schools, some may have even gone on to senior school and further training. I often reflect that those saved lives could be a future leader, doctor, nurse or even Chief. A child whose life would have needlessly been taken but who could go on to impact their community, district even their country, who knows, but at least they were afforded that chance, where so many never get that chance. We would love to come back in June 2018 maybe with some friends and family to celebrate the 10 year anniversary and give opportunity for others to see the work and understand the need and the passion. But for now we journey south knowing we have worked hard and given our best. Thank you to those of you who have made this work possible. Thank you to those of you who have stood with us during our difficult personal circumstances. We wouldn’t be able to make this difference without you.